Lord Owen re-issues correspondence with PM on Britain’s EFTA option outside the EU. As the House of Commons begins a series of indicative votes on the Brexit process beginning on 27 March, Lord Owen re-issues his long correspondence with the Prime Minister on the EFTA option for Britain outside the EU. He believes that the Withdrawal Treaty must be ratified as soon as possible: also that there are ways in which the 27 Member States of the EU and the UK Government can indicate that there is scope within the Political Declaration for the views of the House of Commons to be fully considered within the negotiations during the status quo period currently due to end on 31 December 2020. 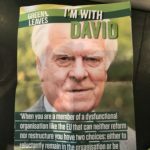 “I’m with David”: Green Brexiteers draw on Lord Owen’s comments to support an alternative view at the recent ‘Put it to the People’ march. 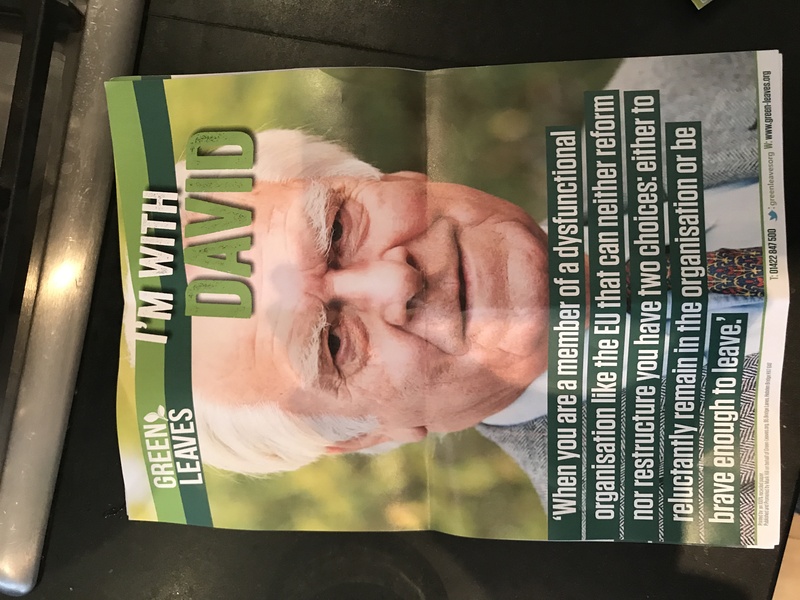 Green party supporters of Brexit handed this flier out at the anti-Brexit march in London on Saturday 23 March 2019. In a major interview with The Guardian, Lord Owen discusses The Independent Group, the Labour Party and Brexit. We must face up to that withdrawal agreement over the next few weeks – and the sooner, the better. “I suggest that in the political declaration, we ask that if on 31 December 2020, the UK wishes, as a non-EU contracting party, to be a member of the European Economic Area, it would not stand in our way but would allow it to go through … This would lead to a number of different things. “We would be able to stand by our pledge to the fishing community to introduce UK management of fishing in our waters … (this) would also give some sustenance to those people in the peripheral parts of this country who are, by and large, overwhelmingly in favour of Britain leaving. “This idea would also put us into an organisation where, if we wanted, we could apply to continue being in the customs union. “…I speak as one who has had to be responsible for international treaties. At the end of the day, you must go into this with the belief that you will carry your country with you. I say to the people who advocate thrusting this aside as if it is a matter of no consequence: it is a matter of huge consequence if we do not live up to our commitments, not just to our electorate and the people who voted in the referendum and the 2017 election, but to those people from 27 countries with whom we went into negotiations. Lord Owen recommends: ‘Brexit is about sovereignty and Parliament must respect that’.